Question. Is it possible to get cuter than these cats? Edith Piaf – Move Over – Two French Cats Singing! Hard to say exactly what is so funny about this video. Is it the two cats are playing Patty Cake? The fact they are singing a children’s song, in French? Or the fact that they beat each other at the end? The thing is – can 4 million people who like French be wrong? Henri Deux (2) describes his melancholy in this touching short film that is receiving raves in the art film circuit. 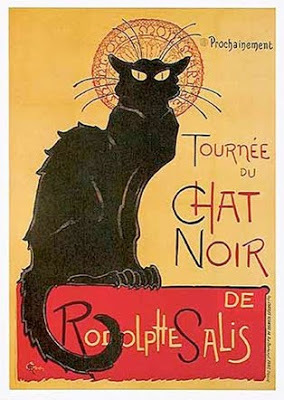 Many years ago, Henri was at the height of his fame – with his visage immortalized in the famous Tournée du Chat Noir poster. These days though, Henri sadly languishes in an apartment – tormented by his past and by his other roomies; a dim white cat, two oblivious budgies and a grey rat. Word is, due to this Holiday Season combined with the poor economy, kitty theft has sky rocketed as kitties are stealing more than ever to try and put something, anything, even an old, disgusting sponge teaming with germs, under the Christmas Tree. “Materialism has spoiled Christmas,” says Santa Claus. “I take some blame for this because of I started the tradition of going down chimneys and leaving presents under tree for those have been good and coal for those that have been bad just because I know. It is sad this now this complete disconnect with the season has trickled to cats.” Santa was unavailable for further comments as he had to rush back to frantically wrapping for his big night a few days away. “Perhaps if you had planned a little better earlier, you wouldn’t be in such a rush” said Mrs Claus as she walked by. Santa was unavailable for further comment but did pause to give Mrs. Claus the evil eye. The editors at Kitty Free Press implore those people with cats seek therapy this holiday season if your cat is a kleptomaniac as this is a serious mental illness and not to be taken lightly. Monrovia, CA–Authorities believe the cat tuna theft ring may be broken with yet another arrest. Watch our exclusive video. Monrovia, CA–After a spate of tuna thefts, Police Chief Roger W. Johnson is advising residents to look their doors and keep an eye out for suspicious felines. Monrovia, CA- – Suspected Tuna thief in custody. Watch our exclusive interrogation video. Kitty Patty-Cake – Fun or Dangerous? Oakdale, MN–Judge for yourself. Harmless kitty fun? Or a game where someone could lose an eye?